Last weekend, the chiliZ esports team joined ESL at the European qualifiers for the PUBG Global Invitational. From hundreds of online qualifiers, just 20 made it through to the offline qualifying round in Leicester, United Kingdom. With a captive esports-mad audience, our intention was to meet a few teams over the course of the weekend, and to educate them about the chiliZ project. 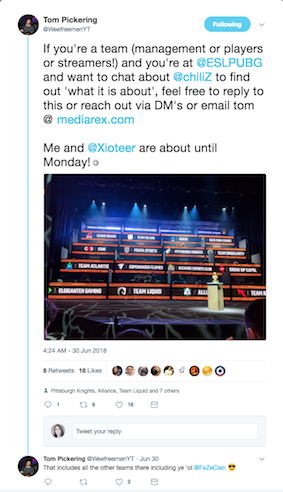 We also wanted to scout for teams that don’t currently have backing to see how we could potentially help them and how we might be able to help the entire PUBG scene. It was a weekend filled with highs for an esports fan. ESL gave us a backstage tour, where we witnessed an impressive set-up, but of course, the most exciting thing was the game play itself. FaZe made it to 4th place after the first game, but lagged behind the team in 3rd place by 760 points. By the second game, WTSG secured their lead over FaZe, and the crowd went crazy. WTSG were at the top of the leading board, pushing Team Liquid to 3rd place — could it be possible that the ‘best’ PUBG team in the world wouldn’t even make it to the first PUBG Major?! FaZe were knocked out, Team Liquid were crowned kings and the Pittsburgh Knights snuck into 3rd place after playing consistently throughout the tournament. The real highlight though was meeting PlayerUnknown himself, who had made an appearance for the final day of the qualifiers. If you’re going to the finals in Berlin, make sure to reach out and say hi. We’ll be there for the whole event!